Laurel is disgusted that Quentin and Dinah are so deep in this investigation about Sarah still being alive. She calls a contact at the Chinese Embassy, and is able to track down the girl in the photo. It is not Sarah. Moira and Frank meet, and Moira tells Frank that Malcolm wants her to find out who put the hit on him. Frank is worried, but Moira sees this as a sign that Malcolm trusts her, and does not suspect her. Malcolm calls Moira and tells her they have arrested a member of the Triad, who is willing to name names in order to make a deal. To avoid herself being named, she gives Malcolm evidence that Frank paid the potential assassins. The Dark Archer kills Frank in front of Moira. I’m still not sure if Malcolm actually trusts Moira, or is just playing her. 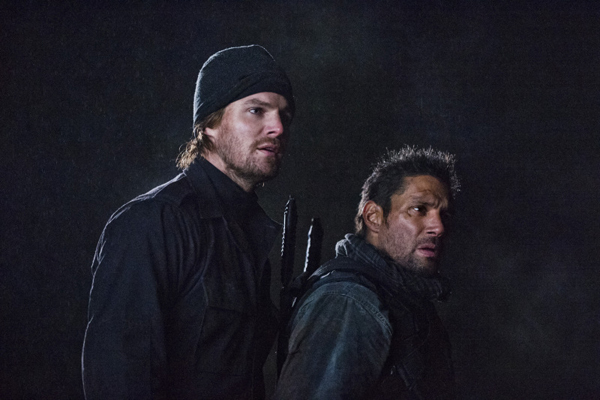 Felicity and Diggle are able to determine that Joseph is using the old subway system to hold his victims. This would explain why Joseph’s internet signal kept moving. Roy tells Joseph that he doesn’t care if he dies. This surprises Joseph, and manages to kill just enough time for Oliver to show up and stop him. Oliver helps Roy escape, and kills Joseph. Thea and Roy make up, and Oliver tells Laurel that he doesn’t want to be on an island anymore. I hope they are not going to tease Oliver and Laurel getting back together again. When Laurel tells Oliver that Dinah thought Sarah was still alive, Oliver gave a look that made me think that maybe she is still alive. Or more happened than Oliver has said so far. Flashback time! Oliver and Slade are making the deal with Fyers for the circuit board. Fyers’ however, has an ace up his sleeve. He has Yao Fei’s daughter, and threatens to kill her if they don’t get the circuit board. Oliver, Slade, Yao, and his daughter manage to fight off the guards and Fyers, and escape. Yao is shot, but he makes them go on without him. When Oliver, Slade, and Fei’s daughter get back to their camp, the circuit board is gone. Fei’s daughter tells them she knows all of Fyers plans.